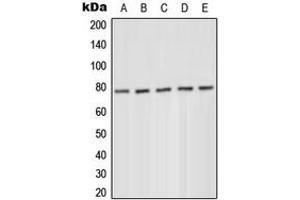 Western blot analysis of PKC delta (pY52) expression in MCF7 serum starvation-treated (A), HeLa PMA-treated (B), Jurkat (C), Raw264.7 serum starvation-treated (D), H9C2 serum starvation-treated (E) whole cell lysates. Specificity Recognizes endogenous levels of PKC delta (pY52) protein. Immunogen KLH-conjugated synthetic peptide encompassing a sequence within the N-term region of human PKC delta.